Posted on 7th June 2018	under Blog. A phone call is still a popular communication method but advancing technology is changing the way we can make a call. There has been an increase in the number of calls made over the internet through popular applications such as WhatsApp, Skype and Facetime. VoIP technology enables traditional telephone services to operate over computer networks. More than 45% of UK businesses have already migrated their communications to a VoIP platform. As a small business owner, you can benefit from many features and have a phone system which grows with your business. Read our simple explanation of what VoIP is and how a VoIP phone system can help your small business. Voice over Internet protocol (VoIP) is a communications technology in which voice calls, as well as video and data, are transmitted over the internet – so there is no need to install landlines for every business phone. VoIP technology converts your voice into a digital signal, allowing you to make a call directly from a computer, a VoIP phone, or other data-driven devices. What is a VoIP business phone system? Rather than having on-premise equipment, a VoIP phone system is hosted in a data centre delivering a host of features that are available on a traditional phone system – but transported via the internet. Call quality is often enhanced due to high-quality equipment and HD voice – VoIP traffic is also prioritised and there’s no interference. With a VoIP connection, calls can be received from portable devices such as a laptop or mobile phone by linking up all equipment and in office computer applications. Perfect for remote working and businesses with multiple offices – resulting in efficient unified communications. What does your small business need? And what makes sense for you to spend here? A mobile workforce: If your team spend a lot of time working remotely, then VoIP can help you stay connected. No IT department: Many small businesses won’t so it’s important to keep things simple. 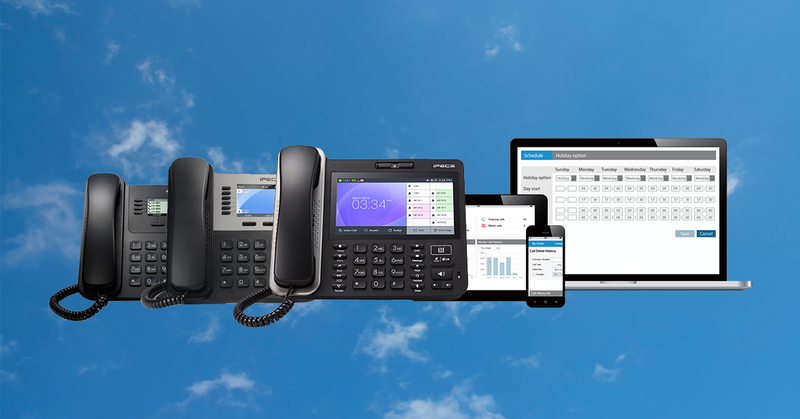 With our cloud-based phone system KloudPBX, all phone system changes can be made via a web portal. A growing business: Research reveals that many businesses with traditional ISDN phone services find it hard to re-route their existing phone numbers if they relocate. With VoIP you aren’t tied to a physical location, making it easy to port your number. Adding users is simple too – all you need is additional hardware. Missed calls: According to research, businesses lose around £90 million a year due to missed calls. VoIP supports call monitoring software meaning you have visibility to your list of missed calls. You can also programme the system to redirect calls to another user after a certain number of rings. CRM integration: A cloud-based phone system can synchronise with your database software. It has the ability to instantly identify your client’s phone number and information. It will display their name before you pick up the phone – saving valuable time compared to a manual database search. VoIP offers many enterprise features which can help to streamline daily operations for small businesses. From call reporting and mobile twinning to auto-attendant and professional music on hold, you can ensure you are setting the right impression from the first point of contact. Businesses who use telephones will need to ensure their phone system runs over an internet connection rather than traditional telephone lines by 2025. This comes as BT has announced plans to switch off the traditional telephone ISDN network and migrate all phone systems online by 2025, affecting millions of businesses across the UK. Moving office or coming to the end of your contract is the perfect opportunity to evaluate your phone system and upgrade to a VoIP solution. Innovative telecoms like cloud-based phone systems will put your small business at the forefront of communication technology. Cloud solutions can decrease a business workload by at least 42%. At DataKom we offer telecom services that are bespoke to your business needs, keeping your objectives in mind. Contact us to find out more.